Working as PADI professionals for several years, my girlfriend Christine and I have been lucky to work for many great dive companies and have had some fantastic adventures worldwide. We both started working in the dive industry to have our days spent playing in the ocean and earning money while we travel—two benefits that we have whole-heartedly enjoyed. However, the rewards and overall impact we’ve experienced on our lives working as PADI Instructors has included many things that we NEVER really anticipated. And we are so very grateful for them! One of the coolest things about diving for a living is that it is NOT exclusive to your home country. 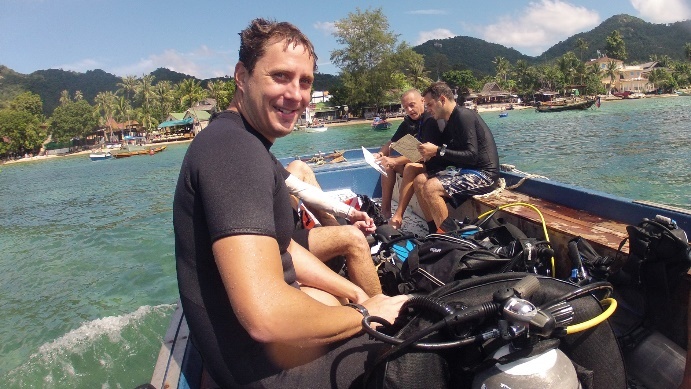 PADI Instructors are in demand ALL over the world and it has allowed us to live in the places where everyone else vacations and dives regularly at some of the most extraordinary sites in the world. We literally make our home in areas that many people set as their desktop screen saver. Many jobs we choose are seasonal, so contracts have often been three or six months long which has been enough time to really get to know a place, but still allowed us to keep moving on and exploring. Christine has taught diving in Fiji, Costa Rica, the Cayman Islands, Mexico, the Virgin Islands, the Greek Islands and most every other place you can book a dive vacation. She has made a trans-Atlantic crossing on a small cruise ship and even kept working when they arrived in the Mediterranean. I have had the chance to lead dives and teach in Hawaii, South East Asia and the Caribbean. 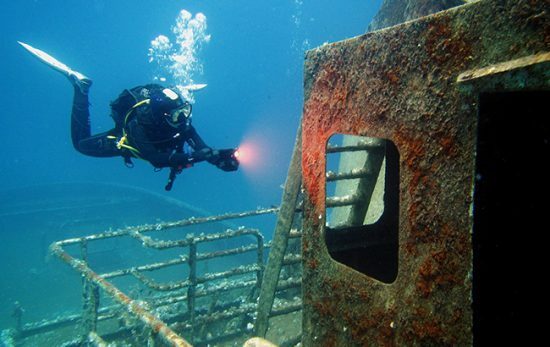 Every time we see a list of the World’s Top 10 Dive Sites, we get excited because we didn’t just dive these sites once, but we experienced many of these dives day after day. So, let’s just answer the question we know you want to ask: No, experiencing the same awesome dive day after day does NOT get old! 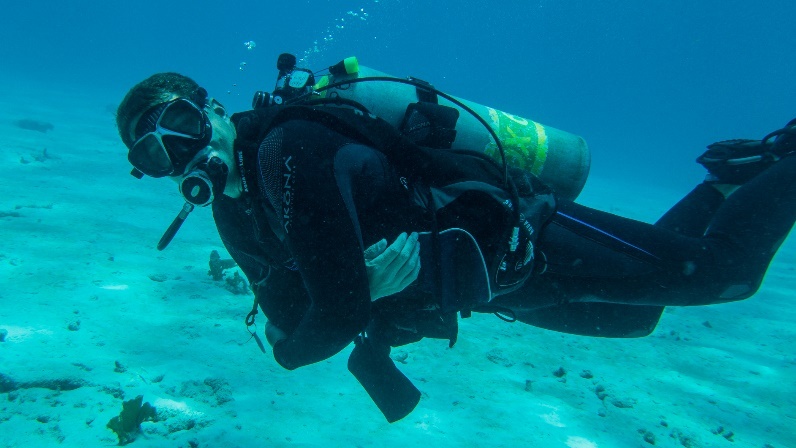 If you’re not careful, while working as a PADI Dive Instructor, you will quickly end up with a boat-load of other skills you may not have ever thought about learning, skills that may end up carrying you to the next opportunity without you realizing it. For example, after a few years of working as a Divemaster on daily boat charters, I accumulated enough sea service time to actually go after my United States Coast Guard Captain’s License. With that license, I ended up being qualified for a guiding job in Alaska, rafting rivers and giving boat tours in some of the most beautiful areas of the untamed north. I had never even considered becoming a Captain, but the opportunity was certainly a good one and has opened some doors for jobs that I otherwise wouldn’t have been considered for. 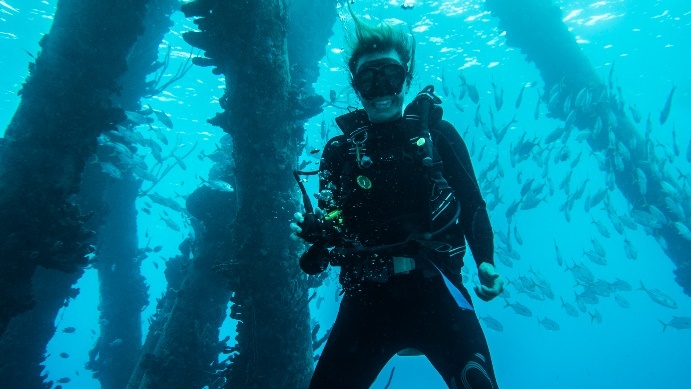 Christine has spent quite a bit of time on liveaboard dive boats as an Instructor. Working on liveaboards requires everyone to pitch in and help (all hands on deck), making you a Jack/Jill-of-all-trades. Christine wound up helping in the galley… A LOT! She learned she loves to cook and it has led to jobs cooking on yachts in Puerto Rico and working as a chef at a ranch in Nicaragua. 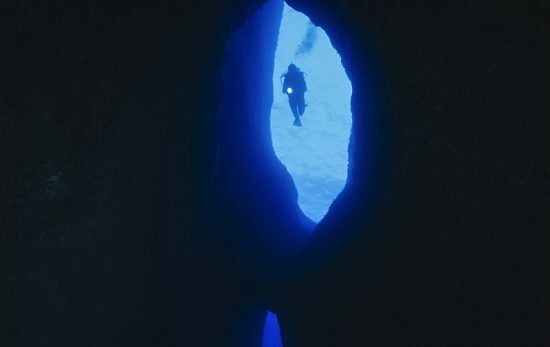 Each dive job has given us new skills which have led the way to our next adventure! Before getting certified, the idea of teaching scuba diving seemed pretty far-fetched and daunting, like it was only for people who have been underwater their whole lives. 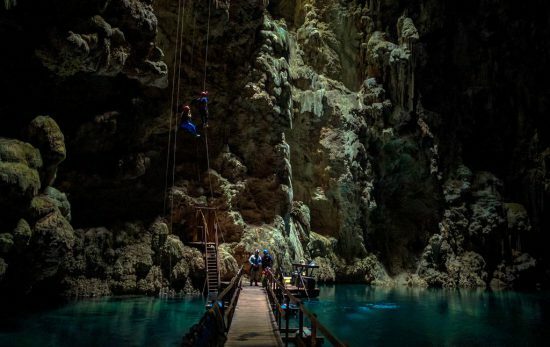 Working in the dive industry for many years has been a big confidence booster, showing us not only how much we can do, but also introducing us to our passion for adventure sports! 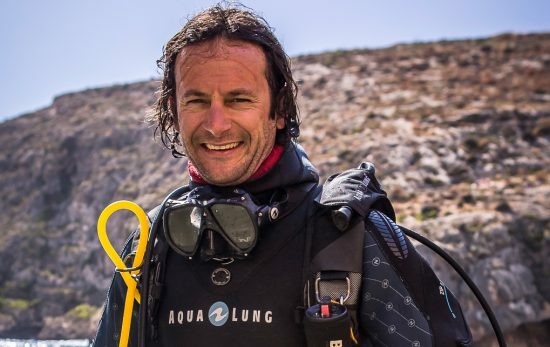 While teaching diving is still what drives us, along the way we have also had many new adventures such as rock climbing, skydiving, yoga, ocean kayaking, hiking, kite-boarding, and so much more. These don’t even include the adventures experienced by simply living in new areas and all the fun changes and traditions that come with a location shift. New foods, new modes of transportation, new apartments…Christine recently faced her life-long fear of driving motor bikes (success!) and I got to try my hand at Thai cooking (nice try)! With each new location comes new faces. One of our favorite parts of starting a new dive job is that it gives us instant access to a community. 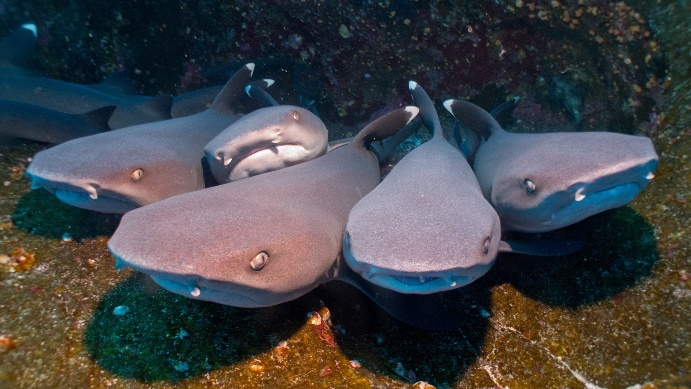 In our experience, most people in the professional dive industry are wildly friendly. I can’t even count how many first days of work ended with dinner on a new co-worker’s lanai or appetizers at some out-of-the-way local’s pub. Combine that with the people you meet in your new neighborhood and city and you have not just visited a new place, but actually started to get to know the townies and local people. While the contracts end and we eventually have to move on, the friendships remain. On top of new friends at work and in your community, being a PADI Dive Instructor feeds you new friends daily in the form of guests and students. We’ve had the unique opportunity to not only help our students experience the underwater world, but also facilitate them to EXCEED their own expectations while educating them about the importance of conserving our oceans. We have both had students who started their first dive day afraid to put their faces in the water, but with time and patience have been transformed into divers who practically won’t get back on the boat because they are so happy in the water. We’ve gotten to teach and get to know people with all sorts of backgrounds and careers including scientists, celebrities and photographers—all wanting to have an unforgettable experience underwater together! As our dive logs pile up, so do our big animal encounters. It doesn’t matter how many dives we have hung out with dolphins, sharks and humpback whales over the years, my heart still beats a mile a minute when they cruise by! It is breathtaking to see so much grace and so little effort come from something so large. 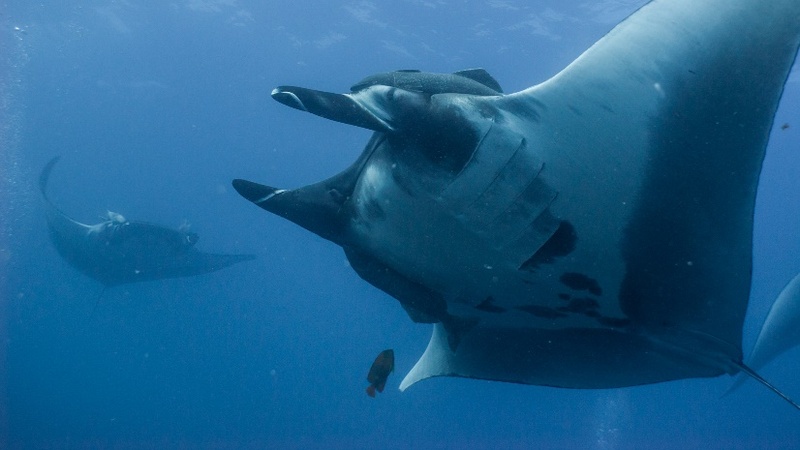 As startling as it was being just feet away from a tiger shark fighting with a spotted eagle ray over a marlin carcass, these are the moments AT WORK that you truly can’t anticipate and make you want to get back underwater again and again. I realize that everyone has their own version of adventure, but I am pretty happy with the one we get to live. 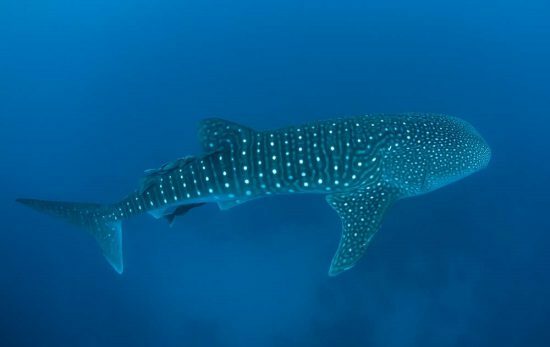 Learning new skills, introducing people to the ocean in the most beautiful destinations all over the world, making friends in dozens of countries and hundreds of cities, and of course, seeing big, beautiful sharks makes for all the adventure I could ever ask for. Every piece is part of the gig and why are so glad to be PADI Dive Instructors. We NEVER know what will happen next! 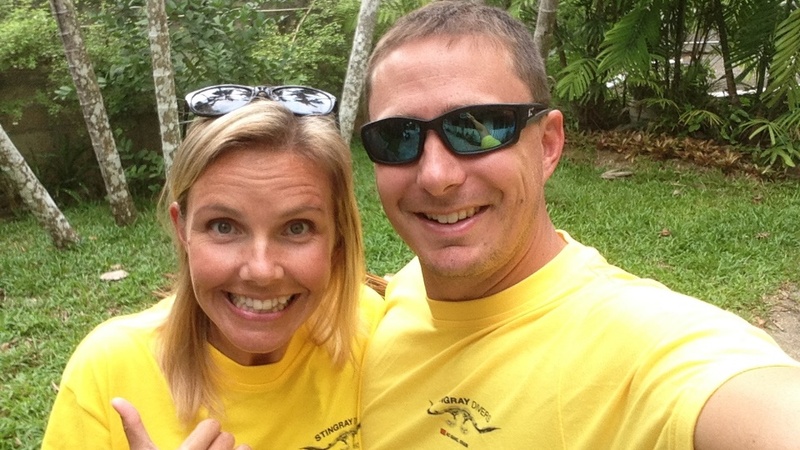 To hear more from Adam and Christine, visit their website: Fins to Spurs.